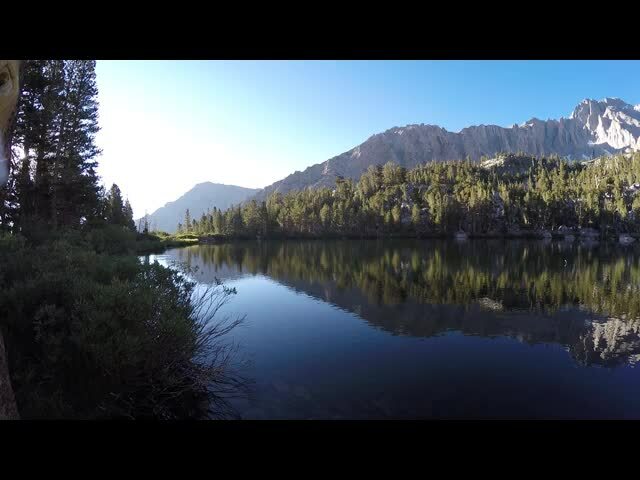 After our original plan to hike in the Cascades was derailed by a forest fire (after we drove all the way up there) we decided to recover from the shock by spending a couple of impromptu nights in the High Sierra. 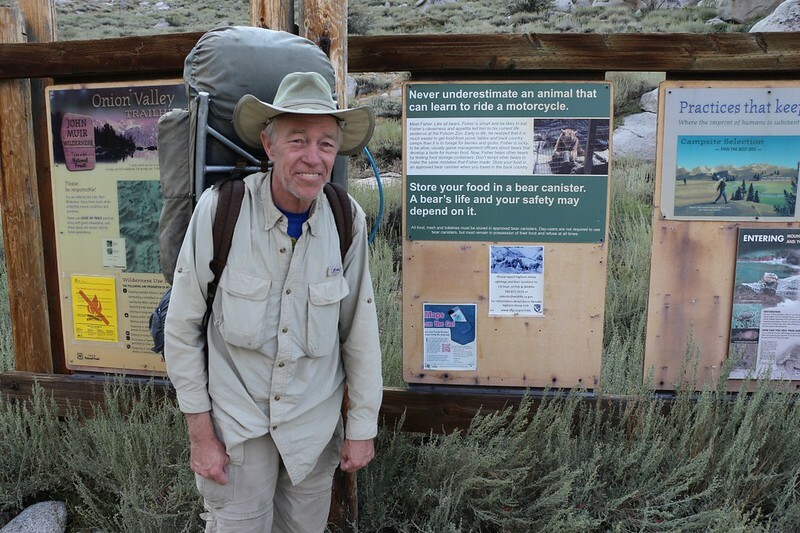 On the way back to California, we stopped at the Bishop Ranger Station in late afternoon and started inquiring about a wilderness permit. 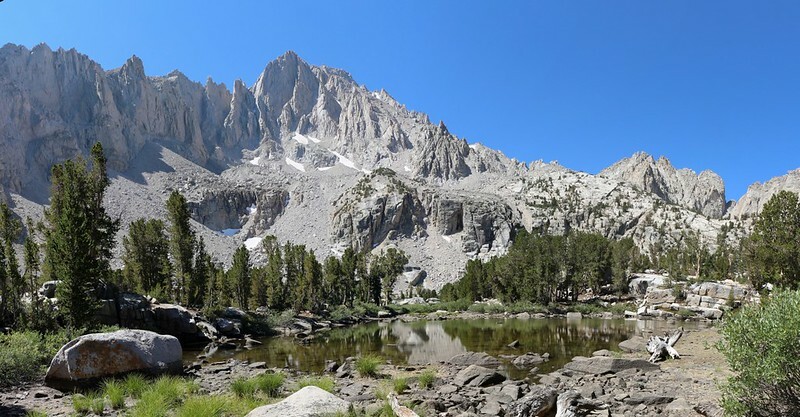 Our top choice was already gone, but our backup option was available: We got a permit for the Kearsarge Pass Trail out of Onion Valley. 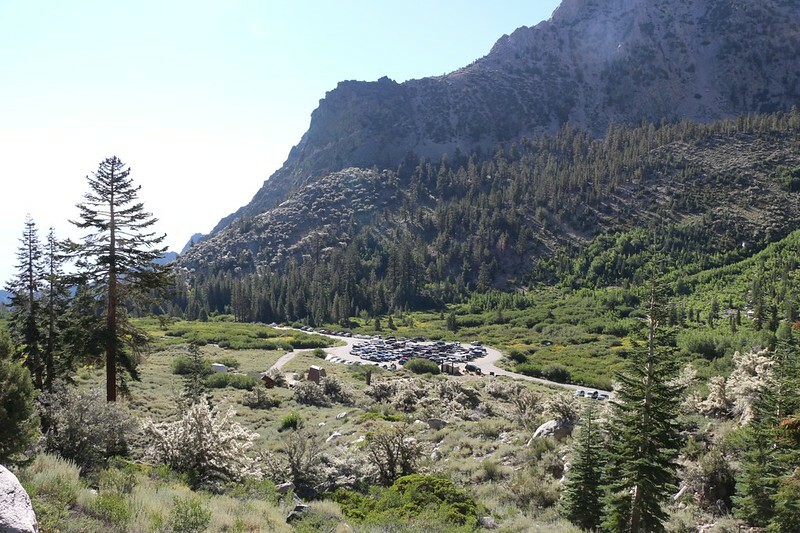 We’d day-hiked the trail back in 2011, but we certainly hadn’t exhausted the exploration possibilities in the area, and we knew that it was exceptionally beautiful. 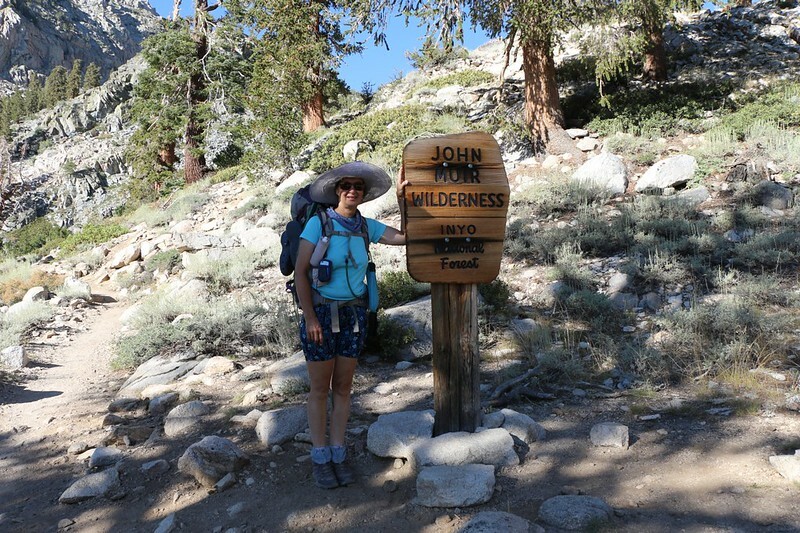 We were only planning to spend two nights, which was much less than the ten-day trek we had planned for the Cascades, but being in the Sierra would make a big difference mentally, and would put us back on track. 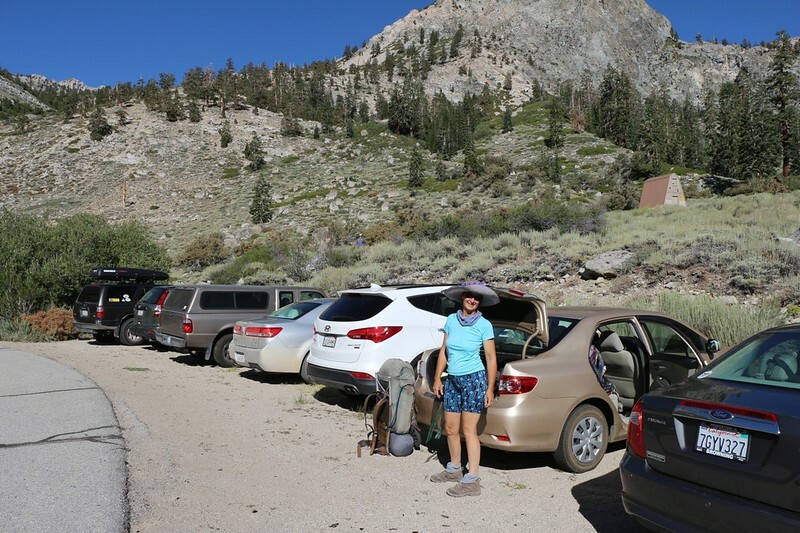 It was over an hour’s drive to Onion Valley, and it was already getting late. 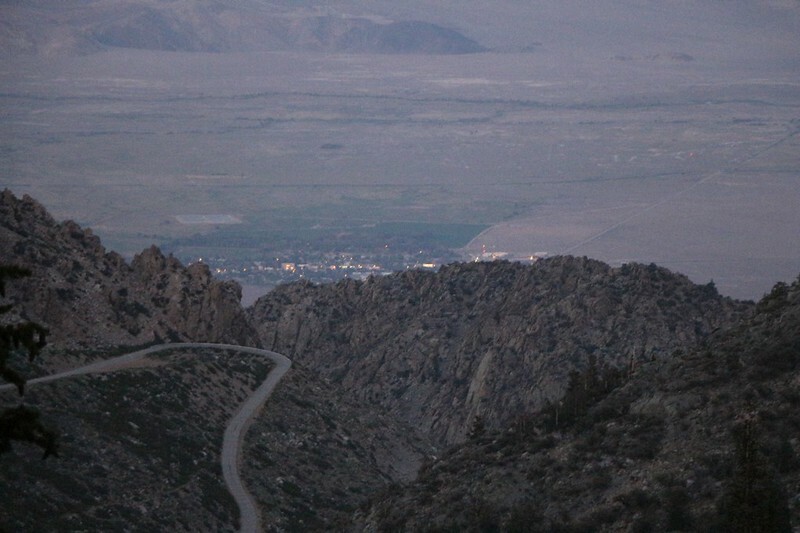 We stopped for a fast-food dinner in Independence, then drove up and up the long winding road into the Sierra. 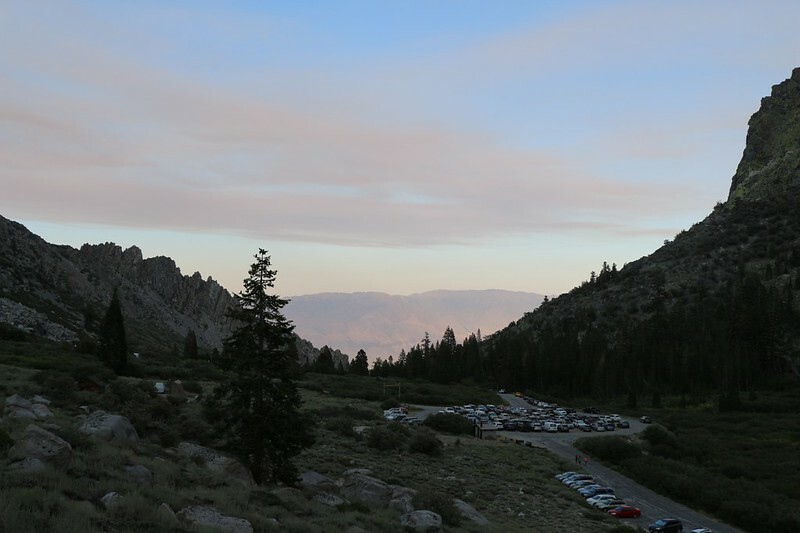 We made it to the trailhead parking lot by 5:30pm and it was already in shadow; the sun had set behind the crest. And then we had even more work to do, for we weren’t really packed for a two-day trip. So we opened up all of our gear and began redistributing everything, particularly the food. We even had to filter some water from the creek. I don’t think that I’ve ever been less prepared at a trailhead in my life. Still, we had everything we needed in the car, if only we could find it. After an hour or so we were ready, and we began hiking at 6:40pm. The sun would set in another hour, but we weren’t worried. We had headlamps and we’d been here once before. That would have to be enough. The trail climbed continuously as the sun went down. 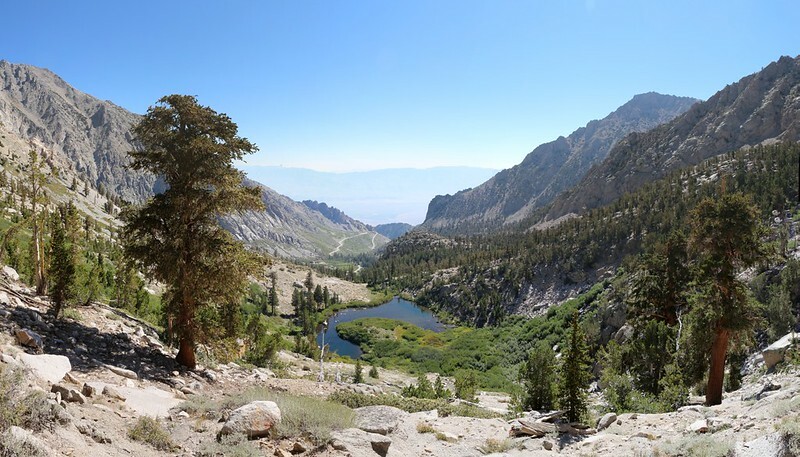 The shadow of the Sierra Crest grew longer, reaching out over the Owens Valley and up the other side. The Horseshoe Fire had been burning a few miles south of us and gave the sunset an added tinge of orange and brown from its smoke plumes. This was the second fire that tried to get in the way of our summer vacation, but luckily we were able to plan our way around it. As long as the wind didn’t shift we’d be fine. It didn’t take long at all before it began to get dark. 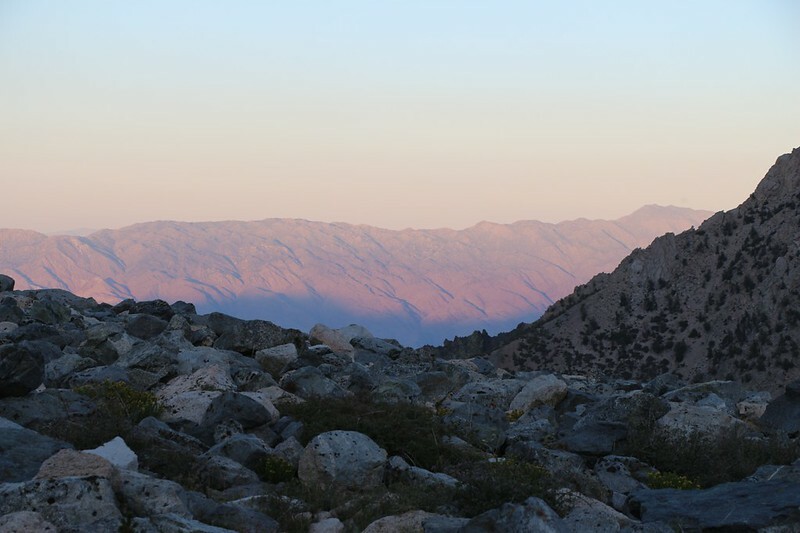 We already had our headlamps ready, so we switched them on and continued hiking. 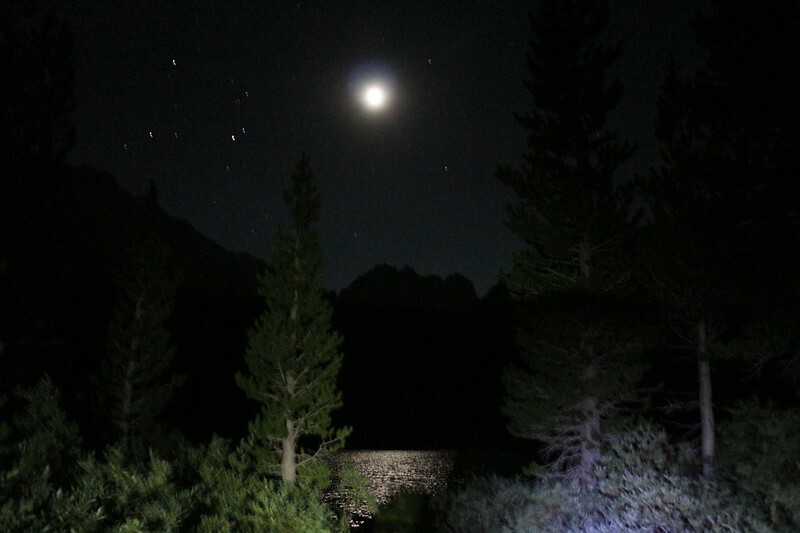 The temperature dropped as the stars and moon came out, and we continued to hike at our usual slow uphill pace. We were barely acclimated to this 10,000 foot elevation, having spent the previous night near Crater Lake at about 6000 feet or so, so we did a lot of extra breathing as we hiked. We sure did enjoy the cool weather, and it was a pleasure to hike under the moon with the lights of Independence twinkling a mile below us. 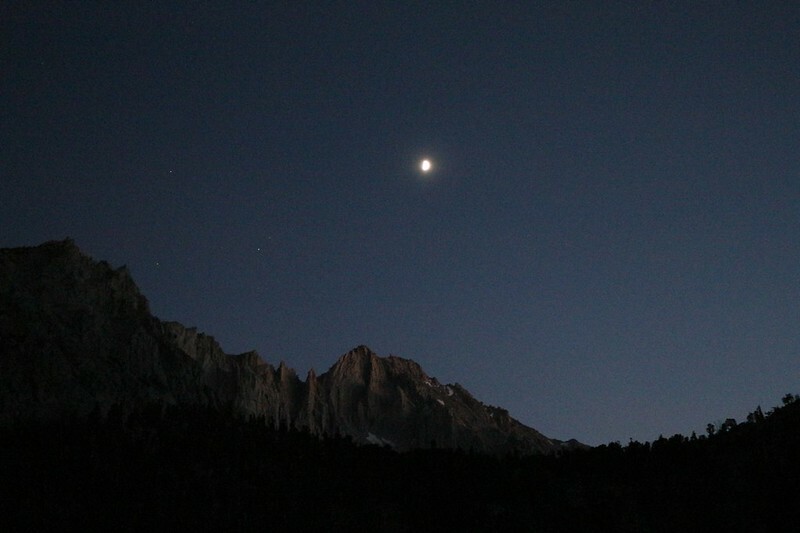 The moon is setting over University Peak, while Little Pothole Lake is down below, shrouded in darkness. We heard the rushing water of Independence Creek as it poured down into Little Pothole Lake, but it was too dark to see the two cascading waterfalls. 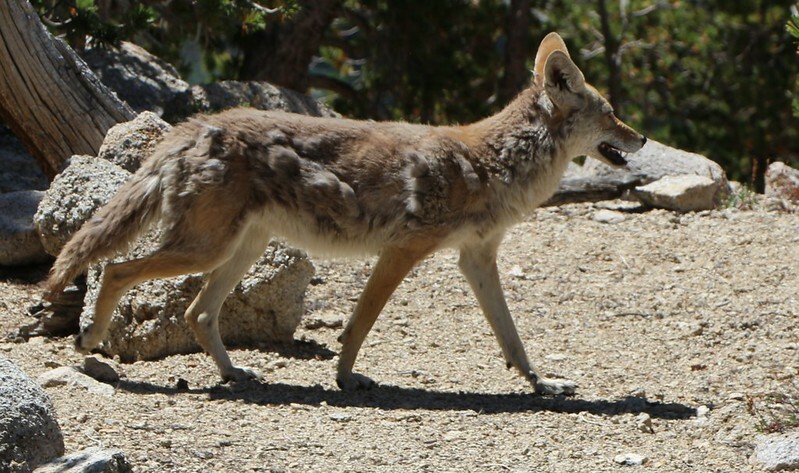 We decided to check them out in the daylight and continued trudging uphill. It was getting pretty late, and Vicki was rather tired (let’s be honest: She was completely exhausted) when we finally made it up the final set of switchbacks. 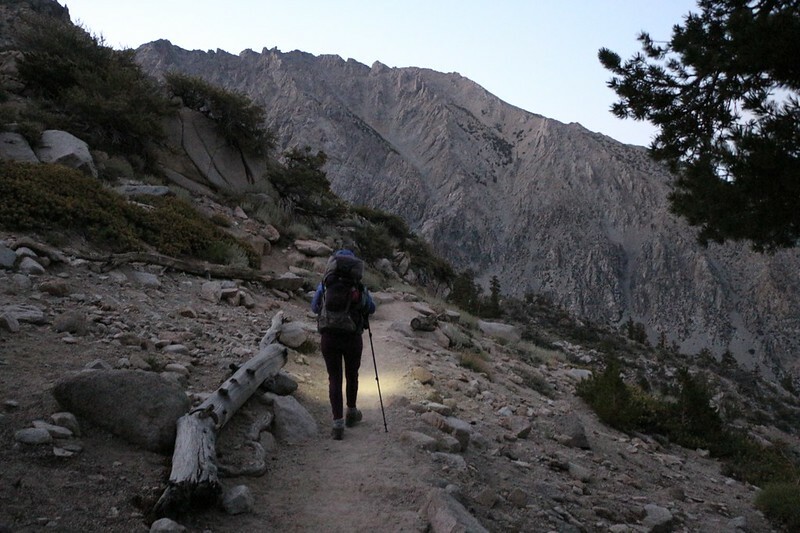 Then all we had left was the walk through the talus-tunnel to reach Gilbert Lake, and the other big challenge of the hike: Finding a campsite in the dark. Vicki stopped for a rest while I headed off to find a spot. As it turned out, we were in luck, as there was a great site not far from where we’d taken off our packs. So I called to Vicki that I’d found one, but she didn’t believe me as it had been much too fast. But it was true, so I came over and grabbed my pack, brought it to camp, then went back and grabbed hers, all in less than a minute. She followed me over and we set up the tent. I blew up the air mattresses and in no time at all we were inside the tent and sleeping soundly. The next morning we noticed that it was getting lighter but we kept closing our eyes and falling back asleep. It was a false dawn, we said. It was only the moon, we imagined. And sleep felt so good. But when our bright yellow tent was hit by an even brighter and yellower sunbeam, we really couldn’t put it off any longer. It was morning, without a doubt. Luckily for us, our big plan for the day was to leave the tent in this very spot, to use it as a base camp, so there was no real rush. I sat up, stretched my back, unzipped the door, and took a look outside. I could see Gilbert Lake down below us through the trees, and its surface was calm and still. And then it hit me: This was one of those “photographer’s moments,” a time when the water is still and perfect reflections of mighty snow-clad peaks can be had. I zipped the door shut and changed clothes as fast as I could. I pulled on my shoes and hustled on down to the lake shore with my camera. I came back to camp and Vicki already had some coffee ready. We ate breakfast and packed for our dayhike. It felt luxurious to leave the tent up for the entire day, rather than our usual hustle to pack everything as quickly as possible. Our plan for the day was to head up into the Matlock Lake basin south of the main trail to check out some of the less-visited lakes. 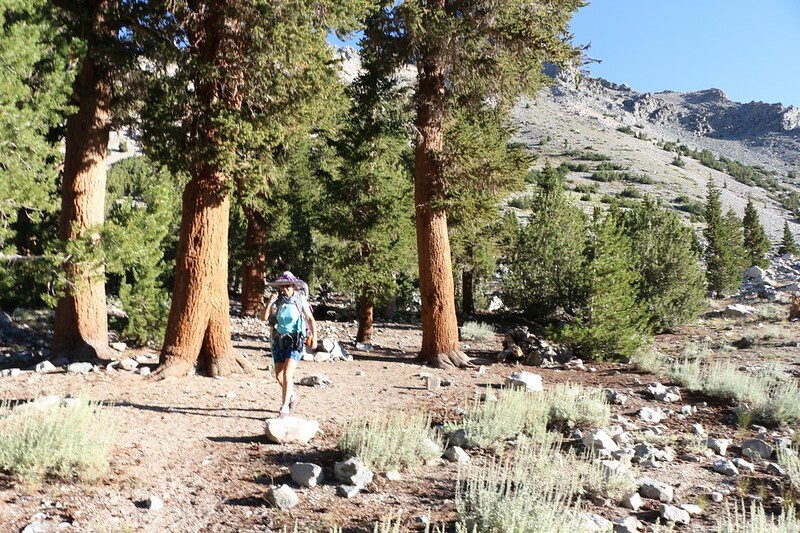 We’d already been up the main trail to Kearsarge Pass and we wanted to do something new this trip. 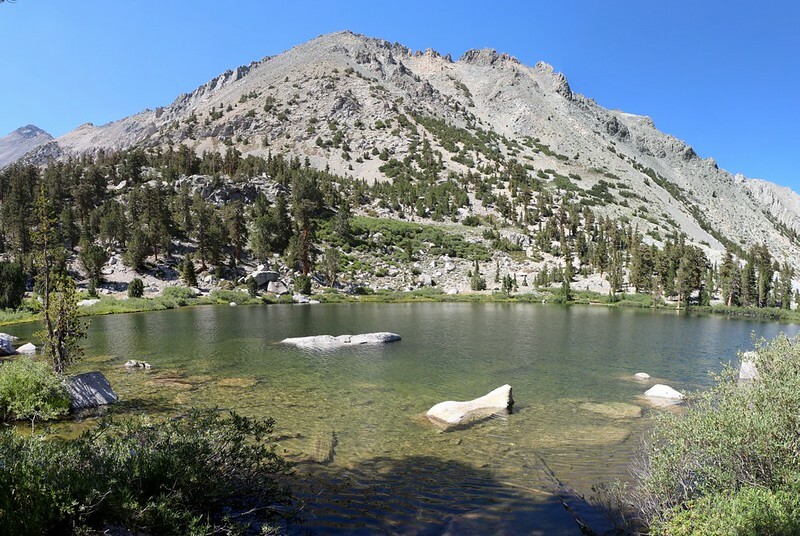 We started by crossing the creek below Gilbert Lake and heading south along the headwall above Little Pothole Lake. There are three streams that cascade down into Little Pothole Lake. 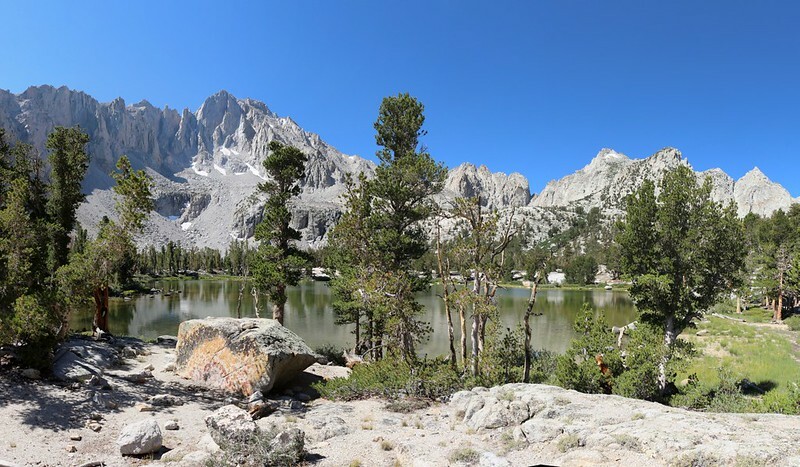 One from Gilbert Lake, one from Slim Lake, and the middle one from an unnamed lake in between. In August 2016, that middle stream was dry as a bone. We followed the watercourse uphill and checked out the unnamed lake. We decided that it was large enough and pretty enough to deserve a name, or at least an elevation number on the topo map, but no such luck. After hiking past two other tiny unnamed lakes that were really more like ponds as they had no obvious inlets and were showing low water levels now that it was August, we hiked on over to Slim Lake. This lake was nestled next to the steep slope below the east ridge of University Peak, and University Peak dominated the views we had of the lake. Stunning! Although there wasn’t much snow left up above, we knew that what was showing was melting and percolating down through the talus fields and feeding the lake. Slim Lake’s outlet was running well and was emptying into Little Pothole Lake down below. We continued onward to Matlock Lake, the largest lake in this basin. This lake, much like Slim Lake and the unnamed lakes, had no fish in it. 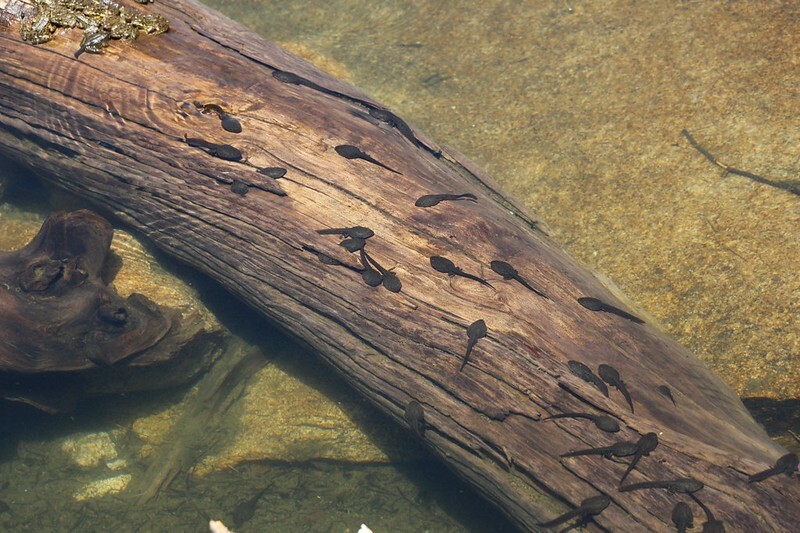 But it sure had plenty of frogs and tadpoles. And they were quite large. It would be noisy around here late at night! I read later on (after we got home) that the park service had purposely poisoned these lakes to remove the non-native trout, specifically in order to allow the Frogs to flourish, as the tadpoles had become tasty trouty treats and had diminished in number accordingly. Our original plan was to head north over a ridge and descend to Flower Lake, but once we reached the ridge and checked the GPS map, we realized that we weren’t very far from Bench Lake and we’d already climbed most of the extra elevation we needed to get there. So we turned aside and climbed up to check it out. And we were glad we did! The views from up there were stunning. The lake sits at 10886 feet, and its waters are pure and clear. And probably ice cold! But we didn’t test them. Instead, we ate lunch up on the ridge east of the lake, looking down upon Matlock, Slim, and the unnamed lakes below us. I read my book while Vicki took a nap, and then I wandered around looking for a bench marker that the map indicated was up there somewhere, but I never found it. Vicki woke feeling refreshed and we headed over the ridge and down to Flower Lake. This lake still had trout in it, and we stood by the shore and watched a fisherman rhythmically fly-casting on the opposite shore. It looked like a great way to relax while on vacation. And, let’s face it, the scenery couldn’t be beat. 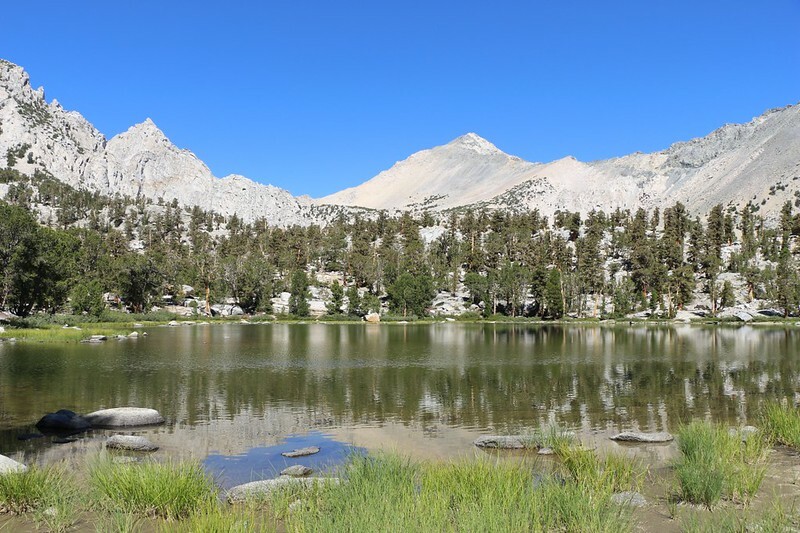 We rejoined the main Kearsarge Pass Trail for a short section back to Gilbert Lake. I took a multi-frame panorama of the lake from above the western shore. Rather than taking the easy trail directly back to camp, we swung around the southern shore of the lake, following the inevitable fisherman’s path. 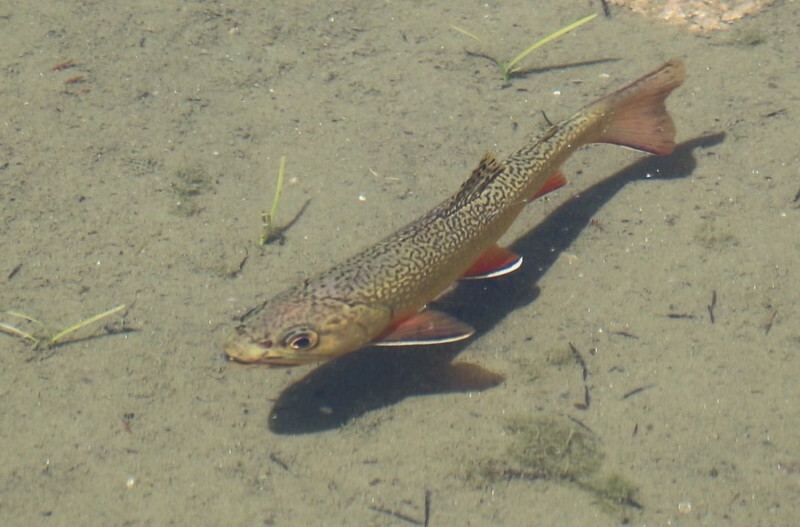 Nearly every lake has a path like this, as anglers are always looking for that perfect location where the mythical grandfather trout lurks. We found a large boulder of our own and took yet another afternoon rest. And why shouldn’t we? We were on vacation! The afternoon was getting on as we arrived back in camp, where we took yet another rest inside the tent, reading and lounging on our comfy air mattresses. This was truly the life! 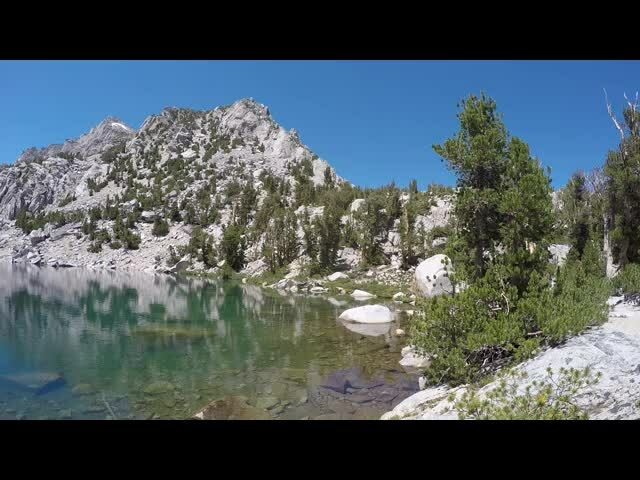 Living the Dream in the High Sierra! Eventually, of course, all naps must end. The sun went behind the mountain and our tent was fully in shadow, and it began to get cool. So we got dressed in some fresh clothing, and added a layer or two. The we went outside and enjoyed the lake in the early evening, with the trout jumping after insects once more. We wondered if they had fun jumping out, and whether they had competitions to see who could get the most air-time. Soon enough we ate dinner, then retired to the tent as the sun went down. This time there wasn’t any smoke visible in the sunset, so we hoped that the forest fire was out. I stayed up for a while reading with my headlamp on, but I soon grew groggy and snuggled down with Vicki for the night. It had been a wonderful day. The day dawned early, and we wanted to get going right away. 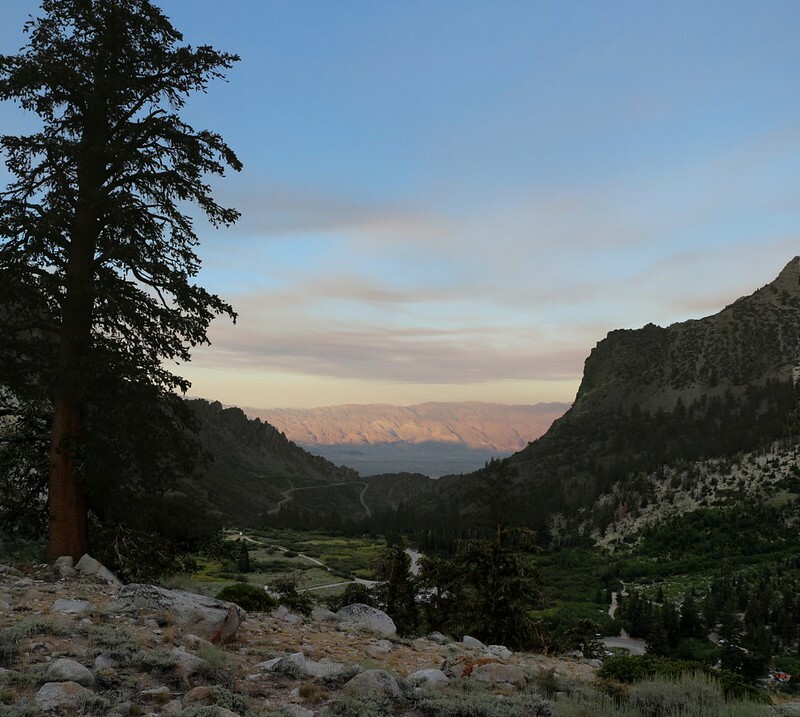 We had plans to drive over the the Ancient Bristlecone Pine Forest and check out the Sherman Grove, which had been closed the last time we were there. So, as usual, I packed up the tent while Vicki put together a hot breakfast, and our timing was perfect. 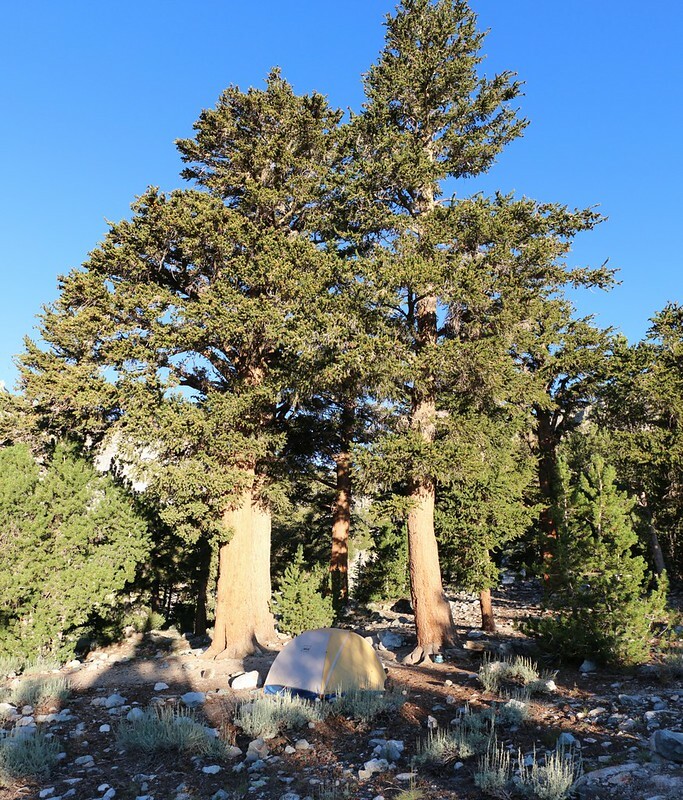 Or at least mine was: I came out of the tent just as the sun arrived in camp, so I could sip coffee while standing in the sun in the crisp morning air. I walked down to the lake with my coffee and took some photos and watched the fish jumping. It was hard to get tired of seeing this. Then I came back to camp and we ate our breakfast. Vicki went in the tent and got dressed for hiking, then we packed up everything. We checked the entire campsite to be sure it was clean and that we hadn’t left anything on the ground. Then we put on our packs and started hiking. 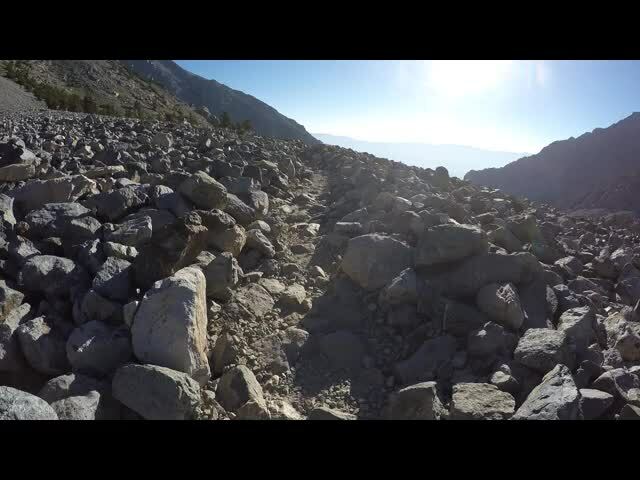 Almost immediately, we were crossing a huge talus field. 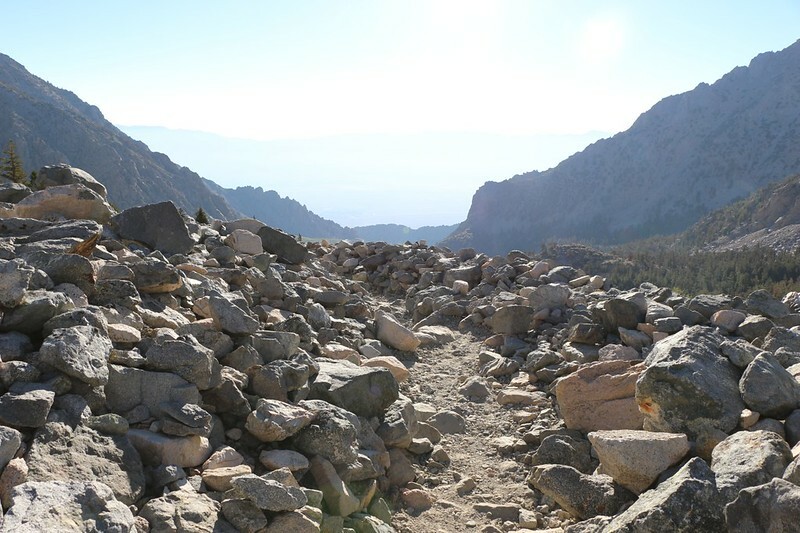 These rocks had been avalanching down the mountain for millenia, and the trail was deep inside the rockfall, like walking down a path with chest-high stone walls on either side of you. And the rocks made cool clinking sounds as you walked over them. We checked out the twin inflows into Little Pothole Lake, and saw where the third, now-dry watercourse ran. This was the one that drained out of the unnamed lake we’d been to yesterday. This would be a much better spot in the spring, with all three streams cascading down into the lake, and also with much larger rates of flow. On the way down we met a number of groups coming up the trail. Several of them had children along, which was good to see. Gotta get those kids out in the wilderness having fun! We gave the ones with fishing poles some advice on where to camp (on the southern shore of Flower Lake) and wished them well. They also let us know the latest news, which was that the Horseshoe Fire had been contained after all, with only a few hundred acres burned. Good news, indeed. And then we continued on, leaving them to have their own adventure. Downhill was some very fast hiking. It seemed like no time at all and we were back at the car. From the trailhead we could see yet another waterfall off to the right, coming down from the Golden Trout Lakes basin. Maybe one of these trips we’d hike up there and check it out. But not this time. We had places to go and seriously ancient trees to check out! Good-bye, Onion Valley! We’ll be back again another day!